Hallway carpet stretching is one of our most requested services, from people selling their homes or from frustrated customers that are simply fed up with trying to get the installation company back out to re-stretch the carpet. Proper hallway carpet stretching starts with possessing the knowledge and tools to perform a proper carpet installation, so that you never have to worry about re-stretching the carpet again in the future. I’m sure you’re familiar with the old saying, ‘if you do it right the first time, you wouldn’t have to do it over again.’ And that’s a philosophy we advocate wholeheartedly. 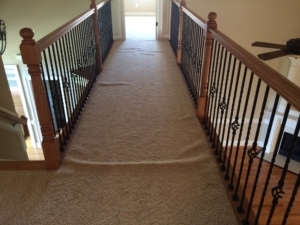 That’s why our Carpet Chemist’s are equip with the industries latest and greatest tools for carpet hallway stretching, walk-in closets, and large rooms. The Carpet Chemist franchise owners Brandon and Tonya Cerrito attend conventions and trade shows every year to current with what knowledge and tools other industry professionals have to offer, and to share our expertise with others. We’ve met the most fascinating people that eat, sleep and breath hallway carpet stretching tools, that have designed state of the art equipment for every single carpet stretching situation imaginable. Often times our customers watch in amazement as our Carpet Chemist pros bring in heavy power stretchers, crab claws, tri-force mini stretchers, and other really neat tools that re-stretch their carpet “drum tight” in a matter of seconds. The carpet ripples instantly flatten right before their eyes! “Oh my goodness, that’s incredible! I should have had this done years ago,” they might say. Our carpet stretching services are backed by a 100% unlimited unconditional lifetime labor guarantee! Large areas. Great rooms, basements, large play rooms, etc. Walk-in closets. Walk-in closets from small to grandiose closets the size of a living room! Hallways. Landing areas to long windy corridors. Stairs. Just a few, or the whole staircase. STEP 2. UPLOAD pic of your wrinkled carpet below, along with square footage. We’re your carpet specialist for life.